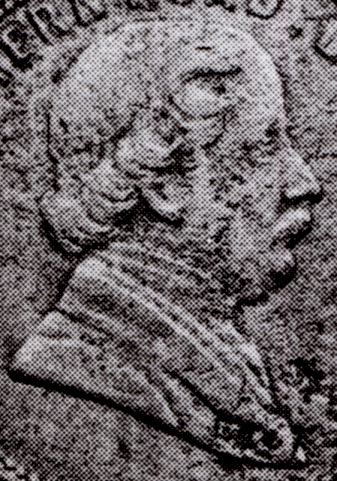 [ABOVE] Portrait of William Lane (1818-1889), taken from one of his trade tokens issued around 1860. William Lane was born in Brighton in 1818, the son of Rebecca and William Lane, a fruiterer and orange merchant of Brighton Place, Brighton. (William Lane junior was baptised at St Nicholas' Church, Brighton, on 16th August 1818 ). In 1822, William Lane senior is recorded as an "Orange Merchant" at 2 Brighton Place, Brighton in Baxter's New Directory of Brighton. In Pigot & Co.'s Sussex Directory for 1832-34, Mrs Rebecca Lane is listed as an orange merchant at 301/2 Brighton Place, so presumably William Lane senior died before 1832. When Pigot's 1839 Directory was compiled, Mrs Rebecca Lane is still recorded as a 'Fruiterer & Greengrocer' at Brighton Place, Brighton. At the time of the 1841 census, William Lane was working as a servant in the King's Road premises of William Henry Goodburn Mason (1810-1879), the well known Print-seller of Brighton. W. H. Mason was the publisher of the popular coloured print "The Brighton Panorama" (1833) and was later to gain attention for producing the famous coloured print of "Cricket Match played between Sussex and Kent, 1849" created by the artists William Drummond and Charles J. Basebe. The print-seller W. H. Mason was the proprietor of Brighton's Repository of Arts and exhibited engravings, lithographs, aquatints and other works of art at his business premises. During his employment with W. H. Mason, William Lane would have had regular contact with artists (Lane was living in the same household as William Drummond, the portrait painter, when the 1841 census was taken) and this might explain William Lane's later interest in picture framing and portrait photography *. On 1st January 1844 at St Nicholas' Church, Brighton, William Lane married Caroline Snelling, the twenty-three year old daughter of Robert and Sarah Snelling. Caroline Snelling, was born in Brighton in 1820 and baptised at St Nicholas' Church on 31st December of that year. Caroline's father Robert Snelling, had been a neighbour of William Lane's mother in Brighton Place, and like Mrs Rebecca Lane, he was a fruiterer and greengrocer by trade. By 1851, Robert Snelling and his wife Sarah had taken up chiropody and, in 1855, Mrs Snelling was working as a chiropodist on the Chain Pier Esplanade. A few months after their marriage, William Lane's wife Caroline gave birth to a baby daughter named Kate. (The birth of Kate Lane was registered in Brighton during the 1st Quarter of 1844). * After he opened his new Repository of Arts at 108 King's Road, Brighton in 1852, W. H. Mason allowed the photographers Thomas Henry Hennah (1826-1876) and William Henry Kent (1827-1897) to establish a Talbotype Portrait Gallery above his printseller's shop. W. H. Mason's Repository of Arts at 108 King's Road was associated with the photography studio of Hennah & Kent until Mason retired around November 1873. W. H. Mason's son, William Henry Mason junior (1840-1888) was active as a photographer in Brighton from the late 1850s until about 1874. [ABOVE] Portrait of a "Tickets", a 19th century ticket writer at work, photographed by John Thomson (1877). William Lane worked as a ticket writer or shop label painter during the 1840s and again in the 1880s when he retired from photography. [RIGHT] W. H. Mason's Repository of Arts on King's Road, Brighton, where William Lane was employed as a young man. 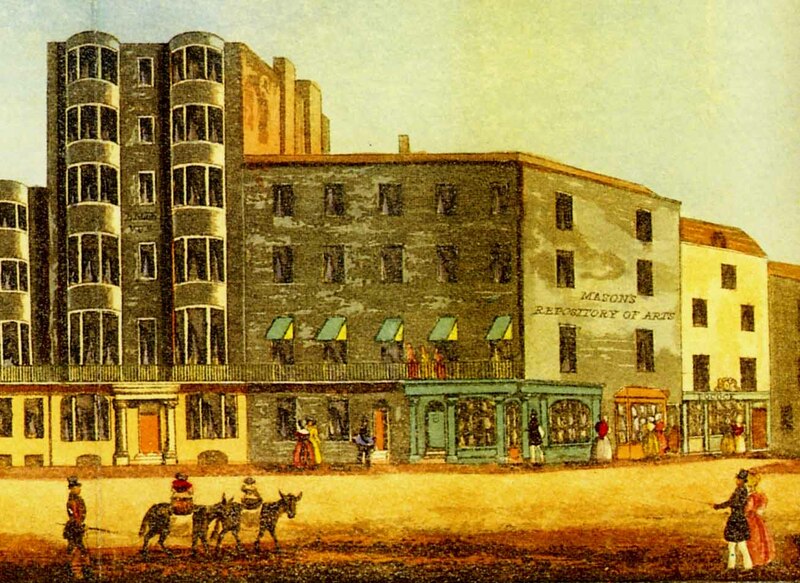 This picture shows Mason's Repository of Arts building on the corner of Ship Street and the King's Road and is taken from a section of W. H. Mason's Panoramic View of Brighton, which he published in 1833. [ABOVE] W. H. Mason's Repository of Arts on King's Road, Brighton, from a section of W. H. Mason's Panoramic View of Brighton (1833). As a young man, William Lane was employed as a servant by print-seller William Henry Mason at his Arts Repository in King's Road, Broghton. 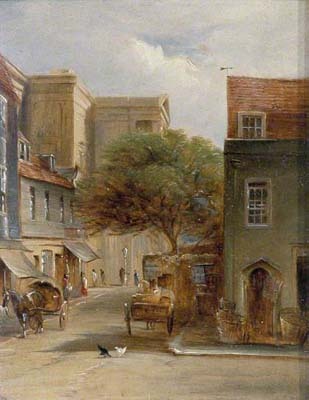 [ABOVE] Market Street, Brighton as painted by the Brighton artist Edward Fox (1788-1875). Around the time of his marriage to Caroline Snelling, William Lane set up as a 'Ticket Writer' in Market Street, Brighton. Lane is listed as a Ticket Writer at 4 Market Street, Brighton in Kelly's Directory of 1845 and three years later he was still working as a Ticket Writer, but this time with an address of 3 Market Street ( Listed in Robert Folthorp's Directory of 1848). A "ticket writer" was a sign-painter who produced the small coloured advertising cards or "tickets" that were displayed in shop windows announcing the price of goods and special offers. William Lane had possibly received some training in the use of a paint brush and colours during his employment at W. H. Mason's Repository of Arts*. *At the end of his working life, William Lane advertised his talents as an "artist and illuminatist (illuminator)"
At the end of 1847, William Lane became the father of a son, William Lane junior ( The birth of William Lane was registered in Brighton during the 4th Quarter of 1847). William Lane now had a wife and two children to support and clearly the earnings of a ticket writer were not sufficient to provide for a young family. By 1852, William Lane had set himself up as a "picture frame maker, carver & gilder" - skills he had probably learned while employed at W. H. Mason's Repository of Arts. At the end of 1852, William Lane's third child, Dora Lane, was born. ( Birth of Dora Lane registered in Brighton during the 4th Quarter of 1852 ). By this time, William Lane had become a manufacturer of picture frames at his business premises in Market Street. In the early 1850s, William was advertising "LANE'S CHEAP PICTURE FRAME MANUFACTORY" with the address of 3 Market Street, near Castle Square, Brighton. Lane's Cheap Picture Frame Manufactory offered to mount and frame "paintings, engravings, water-colour drawings, needle-work &c" at prices "30 per cent. cheaper than any other establishment in the country". During the early 1850s, William Lane had become interested in the relatively new art of photography. It is likely that William Lane was keen to set himself up as a daguerreotype artist and make photographic portraits on a commercial basis at his premises in Market Street, but the patent on the Daguerreotype Process was not due to expire until 14th August 1853. The exclusive daguerreotype licence in Brighton was held by William Constable of 57 Marine Parade, Brighton and Lane was probably aware that Richard Beard, the owner of the daguerreotype patent, had taken legal action against a number of photographic artists for taking daguerreotype portraits without his permission. There was no patent on Frederick Scott Archer's Collodion Positive Process, which involved making photographs on glass plates, but early in 1852, William Henry Fox Talbot had taken an injunction against Richard Colls for producing photographs without a licence from him and Talbot had made it clear he would take to court any photographer who used a negative-positive process to make photographs. By 1852, William Lane had the knowledge to take photographs, but he was not legally free to take portraits professionally and had to be content with selling photographic equipment and instruction manuals. In September 1852, William Lane was describing himself as a "Photographer", but, possibly fearing legal action, he was not offering to take photographic portraits at his business premises. On 10th September 1852, William Lane placed a notice in The Times, carrying the heading "WONDERFUL DISCOVERY - PORTRAITS and VIEWS TAKEN on GLASS by the SUN'S RAYS". William Lane was clearly referring to the method of photography recently invented by Frederick Scott Archer. In the text of The Times advertisement Lane wrote "By this new process any person can produce in a few seconds (at a trifling expense) truly life-like portraits of their friends, landscapes, views, buildings etc". Although the notice was signed "William Lane, Photographer", he was only offering to provide "printed instructions, containing full particulars for practising this fascinating art " in exchange for fifteen postage stamps and he deliberately makes no mention of taking photographic portraits for profit. By August 1853, William Lane was selling daguerreotype apparatus and materials at his Market Street store, which now went under the name of Lane's Cheap Picture Frame & Photographic Apparatus Depot. Lane was now supplying daguerreotype equipment and materials to operators or amateurs, providing "instructions in the Photographic Art", free of charge, to all purchasers of photographic equipment. At the end of the Summer of 1853, William Lane moved his business to 213 Western Road, Brighton, near the top end of North Street. By November 1853, Lane was working as a photographic artist and producing his own daguerreotype portraits at his Western Road premises. [ABOVE] Advertisement placed in The Times on 10th September 1852, by William Lane, Photographer, of 3 Market Street, Brighton. 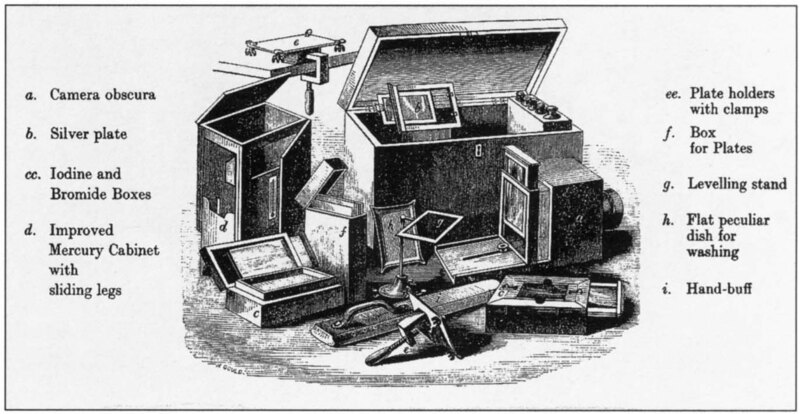 [ABOVE] The type of daguerreotype apparatus and materials that William Lane would have stocked at his Photographic Apparatus Depot at 3 Market Street, Brighton. 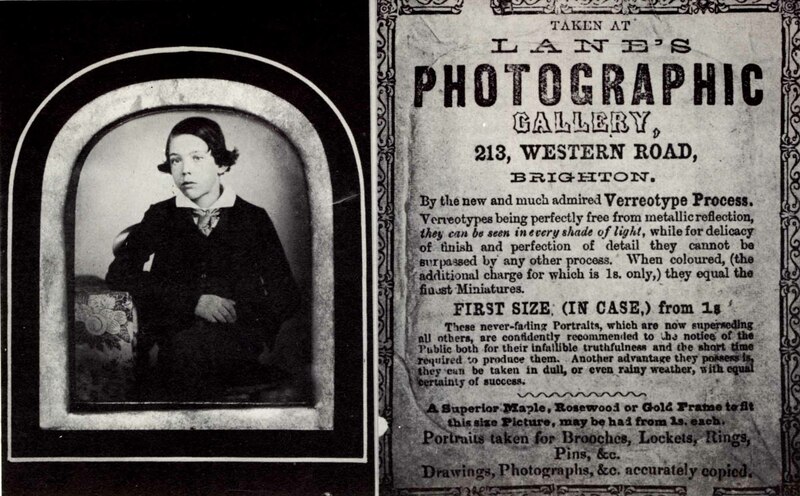 After the patent on the Daguerreotype Process expired on 14th August 1853, William Lane made arrangements for daguerreotype portraits to be taken at his new business premises at 213 Western Road, Brighton. In advertisements published in the Winter of 1853, Lane was offering to provide " A FIRST-CLASS DAGUERREOTYPE PORTRAIT, IN A HANDSOME FRENCH CASE, FOR TWO SHILLINGS". Lane claimed that his Picture Frame Manufactory & Photographic Apparatus Depot was "the only establishment in England where a Warranted Portrait can be had for Two Shillings." 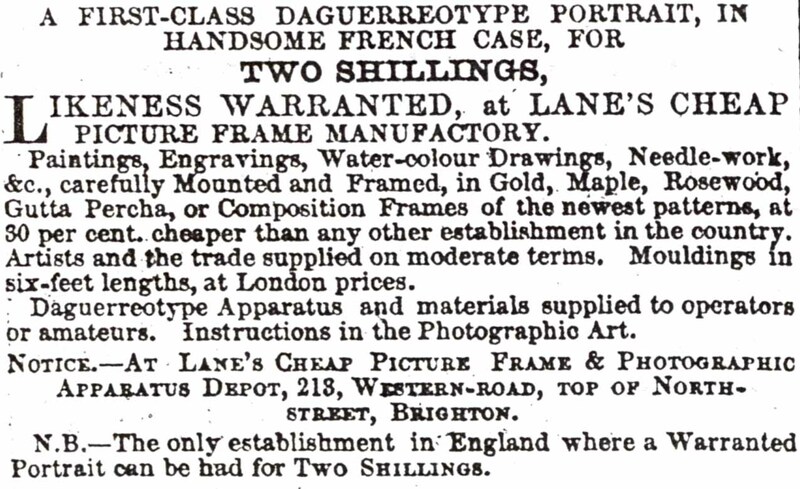 Lane's daguerreotype portraits were considerably cheaper than those offered by William Constable at his Photographic Institution at 57 Marine Parade ( Brighton's first photographic portrait studio which had opened in November 1841 ). However, Lane soon faced competition from the chemist Robert Farmer, who in November 1853 lowered the price of his daguerreotype portraits from 2s 6d to 1s 6d and Edward Collier, who in December claimed he was offering "the only real cheap daguerreotype portraits in Brighton." It seems that William Lane was using the services of a daguerreotype artist named Jesse Harris in the early years of the photography business at the Western Road store. 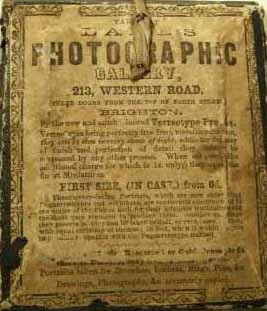 W. J. Taylor's Original Directory of Brighton, published in 1854, lists both William Lane and Jesse Harris as Daguerreotype Artists at 213 Western Road. 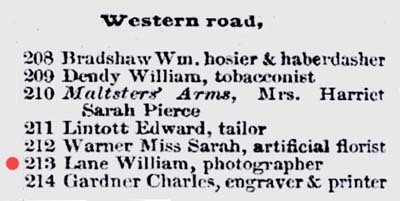 In the Street Directory section of the 1855 Post Office Directory, the entry for 213 Western Road records William Lane as a "picture frame maker, carver & gilder" and Jesse Harris as a "photographic & daguerreotype artist". Lane may have also employed William George Smith, a former Carver & Gilder of Western Road, who is listed as a "photographic artist" at 213 Western Road in Folthorp's Brighton Directory of 1856. 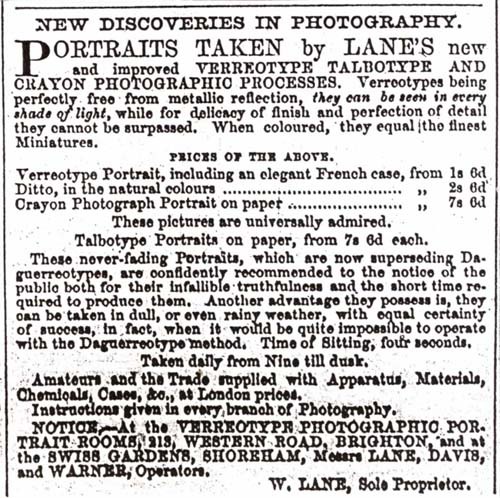 [ABOVE] An advertisement which appeared in the Sussex Advertiser on 12th November 1853 which provides evidence that William Lane was producing daguerreotype portraits at his Western Road store not long after the daguerreotype patent ended in August 1853. [LEFT] A Verreotype Portrait in a French Frame produced at William Lane's Photographic Gallery at 213 Western Road, Brighton (c1860). Verreotypes being perfectly free from metallic reflection, they can be seen in every shade of light, while for delicacy of finish and perfection of detail they cannot be surpassed by any other process. When coloured, (the additional charge for which is 1s. only,) they equal the finest Miniatures. FIRST SIZE, (IN CASE,) from 6d. These never-fading Portraits, which are now superseding all others, are confidently recommended to the notice of the Public both for their infallible truthfulness and the short time required to produce them. Another advantage they possess is they can be taken in dull, or even rainy weather, with equal certainty of success. [ABOVE] The text of the publicity sheet which was pasted on the back of the framed Verreotype portrait, pictured on the left. 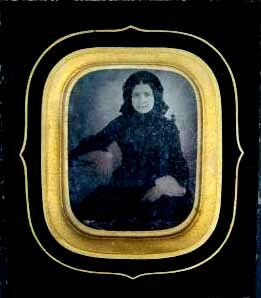 Verreotypes were photographic portraits fixed on glass. Verreotype portraits used the "collodion positive" process introduced by Frederick Scott Archer in 1851. In America such photographs were called "ambrotypes", a name that derived from the Greek word "ambro" meaning immortal or imperishable. William Lane dubbed his photographic likenesses "Verreotypes", which probably stemmed from the Latin word "verus" meaning "true". In other words, William Lane regarded his Verreotypes" as a type or kind of "true likeness". William Lane had promoted the new photographic process of making "portraits and views taken on glass" as early as September 1852. In an advertisement placed in The Times, dated 10th September 1852, William Lane claimed that "any person can produce in a few seconds, at a trifling expense, truly life-like portraits." Early in 1853, William Lane's Cheap Photographic Depot was offering a "complete set of apparatus for the glass or paper process" for the sum of 4 guineas (�4. 4s/�4.20p). The new photographic process championed by William Lane was based on the Collodion Positive method of making portraits, which had been invented by Frederick Scott Archer in 1851. Frederick Scott Archer had discovered that he could produce a cheap alternative to the daguerreotype portrait by placing a bleached or under-exposed collodion glass negative on a black background. By backing the specially prepared collodion glass negative with black paper, very dark varnish or velvet cloth, the image took on the appearance of a clear, sharp positive picture that resembled the more expensive daguerreotype portrait. In America, "collodion positive" portraits were dubbed "ambrotypes". William Lane preferred to use the term "Verreotype" for these "never-fading" photographs on glass. The "collodion positive" or "Verreotype" process was a cheap and speedy method of making photographic portraits. Protected by glass, placed in a metal frame and inserted in a presentation case or an elaborate frame, the collodion positive was an inexpensive substitute for the daguerreotype portrait. Verreotype portraits also had a clear advantage over Daguerreotype images, which were made on highly polished, silvered copper. 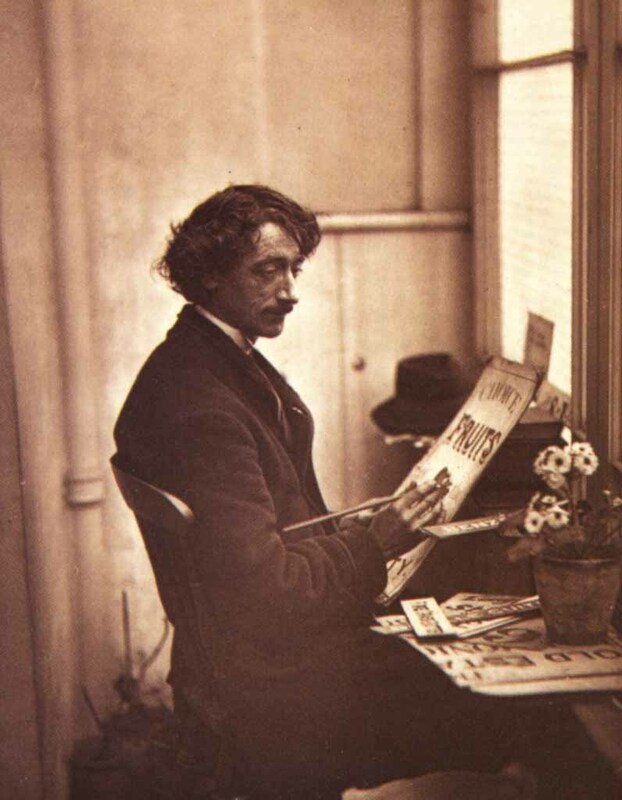 As Lane explained in his publicity, his Verreotypes were "perfectly free from metallic reflection", and could "be seen in every shade of light ". William Lane charged between 6d and 2s 6d for his Verreotypes. Lane's Photographic Portrait Gallery at 213 Western Road, Brighton, which was now producing Verreotypes exclusively, proved to be a great success. In the Spring of 1855, William Lane opened a second photographic portrait gallery in the grounds of the Swiss Gardens, Shoreham. In 1855, William Lane was describing himself as "The Proprietor" of these two studios, but he was also clearly working as a photographer. Newspaper advertisements from this time show that William Lane was employing two other operators, Mr Davis and Mr Warner *. * Mr. Warner, the camera operator mentioned by William Lane in his newspaper advertisements during 1855 and 1856 was Richard Warner junior (1827-1874). Richard Warner was born in Brighton around 1827, the son of Richard and Esther Warner. Richard Warner senior, Richard's father was born in Fareham, Hampshire in 1795 and after his marriage to Esther, he settled in Brighton, where he worked as a hotel porter. On 14th April 1849, Richard Warner junior married Maria Batchelor (born c1830, Somerstown, London ) at St Nicholas Church, Brighton. At the time of his marriage, Richard Warner junior was working as a painter and he is described as such when the 1851 census was taken. The 1851 census return records Richard Warner as a "Painter", aged 22, living with his wife Maria, a twenty-one year old bonnet maker, at 124 Edward Street, Brighton. A son, Richard Ernest Warner was born in 1851, but he died before the end of 1852. A daughter, Maria Christiana Warner, was born in 1853 ( baptised 6th November 1853). In 1854, Richard Warner was still living in Edward Street. Around this time, William Lane recruited Richard Warner as a camera operator. A second daughter, Emma Jane Warner, was born in 1859 ( baptised 2nd October 1859). Richard Warner was probably employed by William Lane as a camera operator or photographer between 1854 and the early 1860s. At the time of the 1861 census, Richard Warner is recorded as a "Photographer", aged 31. Richard Warner is shown living at 49 George Street, Brighton, with his wife Maria and his two surviving children - Maria Christiana, aged 7, and Emma Jane, who was approaching her second birthday. By 1867, Richard Warner had set up a photographic portrait studio at 49 George Street, Brighton ( SOURCE: J. Harrod & Co.'s Postal and Commercial Directory of 1867 ). During this period Richard Warner became the father of two sons - Horace Warner, who was born in 1862, and Frank Warner, who was born in 1864. Richard Warner died on 28th December 1874 at 49 Ashton Street, Brighton, at the age of 47. The cause of death was given as "phthisis" - a term used to describe a progressive wasting disease. "Phthisis" was commonly associated with a disease of the lungs or pulmonary tuberculosis. [ABOVE] An advertisement for William Lane's Photographic Portrait Rooms located at 213 Western Road, Brighton and the Swiss Gardens in Shoreham. (Brighton Guardian, 22nd May 1855 ). In the spring of 1855, William Lane opened a photographic portrait studio inside the grounds of the Swiss Gardens, an amusement park in Shoreham, a seaport town situated six miles west of Brighton. The Swiss Gardens had been created in 1838 by James Britton Bailey, a wealthy shipbuilder, and became a popular pleasure resort after the main railway line reached Shoreham in 1841. 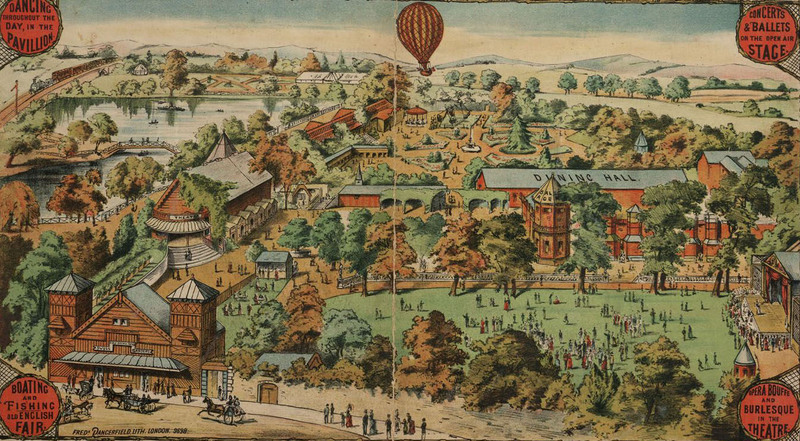 In the summer of 1855, Edward Goodchild, the proprietor of the Swiss Gardens, was placing advertisements which named the " New Photographic Gallery on the Lawn" as among the "recent improvements" to the pleasure gardens. William Lane was advertising his branch studio at the Swiss Gardens, Shoreham in May 1855. Some nine years later, William Lane published a series of Views of the Swiss Gardens, Shoreham, which could be purchased at various places in the pleasure gardens, including the Bar, the Ballroom and the Confectionery. "Verreotypes being perfectly free from metallic reflection, they can be seen in every shade of light, while for delicacy of finish and perfection of detail they cannot be surpassed. When coloured they equal the finest Miniatures....These never-fading Portraits, which are now superseding Daguerreotypes, are confidently recommended to the notice of the public, both for their infallible truthfulness and the short time required to produce them. Another advantage they possess is, they can be taken in dull, or even rainy weather, with equal certainty of success, in fact, when it would be quite impossible to operate with the Daguerreotype method." William Lane claimed that a portrait sitting using the Verreotype process would take only four seconds. For a "Verreotype Portrait, including an elegant French case", Lane's prices started at 1s 6d. Customers would have to pay an additional charge of one shilling, bringing the total price to 2s 6d, if they wanted their portrait to be coloured to resemble a painted miniature. William Lane also offered "Talbotype Portraits on paper" for the sum of 7s 6d. William Henry Fox Talbot, the inventor of the calotype process (a negative/positive method of producing photographic prints) had recently relaxed his control over the production of photographic prints on paper (Talbotypes) after a series of unsatisfactory legal actions against photographers, whom he believed were infringing his calotype and Talbotype patents. Up to 1855, the proprietors of two photography studios in Brighton, Hennah & Kent of 108 King's Road and Grey & Hall of 13 St James' Street had to pay to William Henry Fox Talbot an annual fee of between �100 and �150 for permission to produce Talbotype portraits. A number of professional photographers, notably Martin Silvester Laroche and James Henderson, had challenged William Henry Fox Talbot's legal right to control the production of Talbotypes. James Henderson, who in the Summer of 1855 had opened a photographic portrait studio in Brighton at No 5 Colonnade, New Road, where he produced "Photographic Portraits on Paper", placed an advertisement in the Brighton Herald of 4th August,1855 to remind "all lovers of Photography that he has been at considerable expense in defending the freedom of this beautiful art against Mr. Fox Talbot, the Patentee of the Talbotype Process." William Lane was to take advantage of this newly won freedom to produce Talbotypes. Grey & Hall, who had paid a licence fee to Talbot, charged 15 shillings for a Talbotype portrait, yet Lane was able to charge half this price. [ABOVE] William Lane listed as a "picture frame maker" and "carver & gilder" at 213 Western Road, Brighton in the 1855 edition of Kelly's Post Office Directory of Sussex. William Lane was sharing his business premises with Jesse Harris, a "photographic & daguerreotype artist". [ABOVE] William Lane listed as a "photographist" at 213 Western Road, Brighton in the 1858 edition of Melville & Co.'s Directory of Sussex. [ABOVE] William Lane listed as a "photographer" at 213 Western Road, Brighton in the 1859 edition of Kelly's Post Office Directory of Sussex. 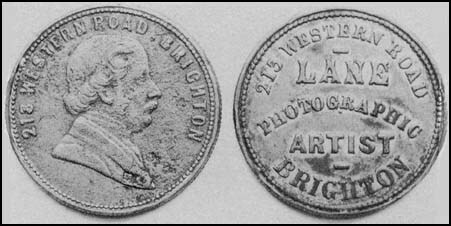 [ABOVE] Two photographer's advertising tokens issued by William Lane of 213 Western Road, Brighton (c1860). William Lane appears to be one of the few photographers who issued specially struck coin-like medallions or tokens to advertise their studios. Lane was following an old tradition, whereby traders produced tokens in copper or brass, because there was a shortage of low denomination coins. Trade tokens were originally produced by traders and companies as substitutes for official coins and would normally have the nominal or face value inscribed upon them. Such trade tokens were outlawed after 1813, but in Victorian times some businesses issued tokens or medallions for advertising purposes. An advertising medallion were inexpensive to produce and more durable than the usual business cards. William Lane's advertising tokens did not carry a specific value, but are inscribed with the issuer's portrait and details of his business. The two sides of the advertising token shown above gives the address of Lane's studio at 213 Western Road, Brighton. Another token issued by William Lane carry the following inscriptions : "LANE'S PORTRAITS - BEST IN THE KINGDOM - PRICES FROM 6d TO ONE GUINEA" and "LANE - PHOTOGRAPHIC ARTIST - 213 WESTERN ROAD, BRIGHTON". [ABOVE] Portrait of a Boy (c1858). "Verreotype" portrait taken at Lane's Photographic Gallery, 213 Western Road, Brighton. The Brighton photographer William Lane called his collodion positive portraits, "Verreotypes". In America they were known as "ambrotypes". The name "ambrotype" derived from the Greek word "ambro" meaning immortal or imperishable. William Lane preferred the name "Verreotype" which probably stemmed from "verus", the Latin word for "true" or "truthful". In Melville's Directory of Sussex for 1858, William Lane is listed as both a "Photographist" and a "Carver & Gilder" at 213 Western Road, Brighton. In Folthorp's Brighton Directory of 1859, William Lane's name is listed under the heading of "Photographic and Talbotype Artists" in the Trades Section. Although he was still able to provide "Superior Maple, Rosewood or Gold Frames", by 1860 William Lane clearly saw himself primarily as a 'Photographic Artist'. When the 1861 census was taken in Brighton, William Lane is recorded as a "Photographic Artist" aged 43. On the census return, William Lane is shown living at 213 Western Road, Brighton with his forty-year old wife Caroline and his two daughters - seventeen year old Kate Lane, who was working as an assistant to her father, and Dora Lane, aged eight. [RIGHT] A 19th century map showing the location of William Lane's business premises at 213 Western Road, Brighton (1865). William Lane was based at 213 Western Road from 1853 to 1862. In 1853, William Lane was charging 2 shillings for a "first class daguerreotype portrait in a handsome French case". After the "collodion positive" process superseded the daguerreotype during the early 1850s, William Lane began to produce "Verreotype Portraits" at his Brighton studio. Customers were charged 1s 6d for a verreotype portrait in an elegant French case, and were expected to pay an additional shilling if they wanted their portrait coloured by hand. Verreotypes were photographic images fixed on glass. William Lane could also provide photographic prints on paper, priced at 7s 6d. A trade token produced by William Lane around 1860 advertised photographic portraits with prices which ranged from sixpence to one guinea (21 shillings). [ABOVE] William Lane's scale of charges as featured in an advertisement published in the Brighton Guardian in May 1855. 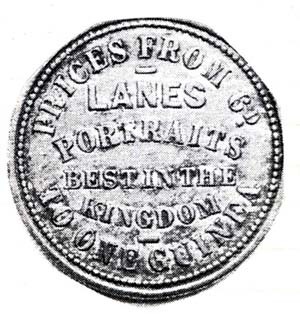 [ABOVE] A trade token issued by the photographer William Lane which carries carry the following inscription : "LANE'S PORTRAITS - BEST IN THE KINGDOM - PRICES FROM 6d TO ONE GUINEA"